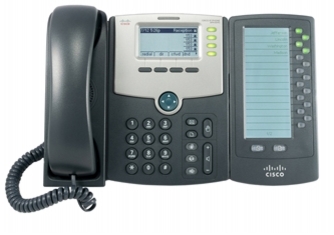 The Cisco SPA500DS Digital Expansion Module is part of the Cisco Small Business Pro Series and designed for use with the Cisco SPA500 Series IP Phones. It is an ideal solution for small businesses wanting to simplify incoming call handling by quickly directing calls to the requested party and also to monitor line status from a central location. The SPA500DS Digital Expansion Module is for offices of managers, administrators, and operators. It is shown here with an SPA500 Series phone (not included). The SPA500DS Digital Expansion Module is a 15 button key expansion module with LCD Display which is compatible with all Cisco SPA500 series IP telephones.